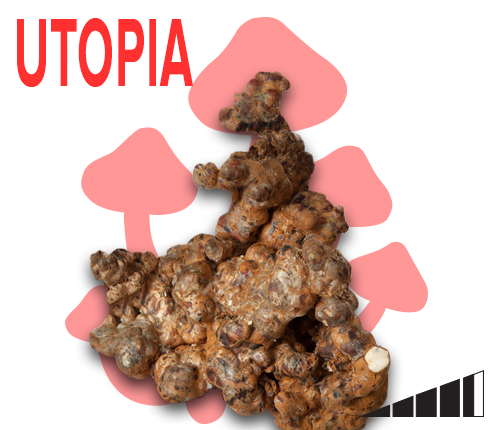 The Psilocybe Utopia is one of our showpieces. It takes you to a magical world where you will see just as much with your eyes closed as with your eyes open. One moment plays out in slow motion and the next moment in fast forward. You will see colours, lights and patterns which you cannot see normally. A must for everyone who likes to trip. 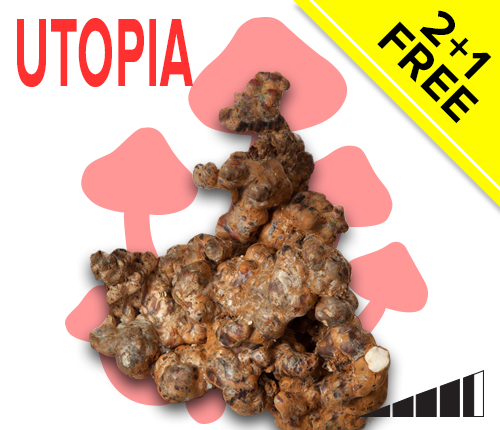 The Psilocybe Utopia is a variant of the Psilocybe Atlantis and has been cultivated so it can grow for much longer. 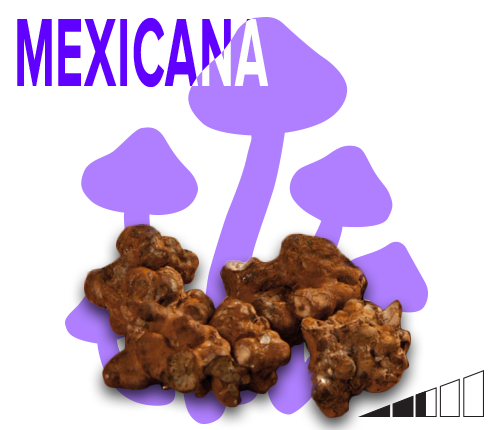 Normally magic truffles are ripe for harvest after 4 to 6 months. However, the Utopia can get up to 9 months. 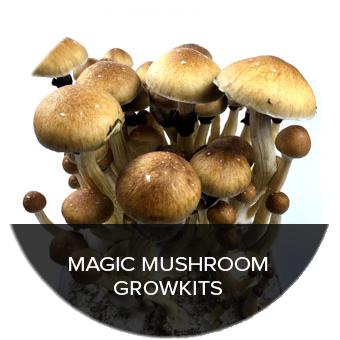 This way it also produces a lot more psilocybin than the other species. 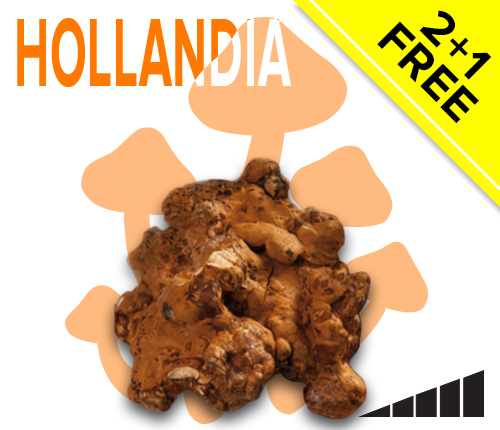 Only the Psilocybe Hollandia comes close to that, but that has a different effect entirely. 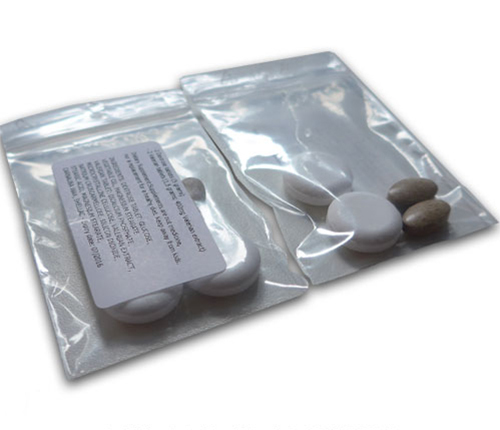 Because the Psilocybe Utopia is a very strong species, beginners should be careful with the dosage. Half a portion of 7.5 g suffices in that case. Experiences users can take a whole portion. Amazing visuals, philosophical thoughts and a pleasant body high are guaranteed. This Utopia gives you a trip you will never forget and will want to share with everyone. Because the trip is very clear and intense you experience everything with a great deal of awareness. Recommended for everyone! I really enjoyed these truffles. I took all 15g on an empty stomach using trufflemagic’s preferred preparation from the ebook. The trip was neither too strong or weak, it was exactly what I needed. Very deep analysis into the nature of being, of the continuum of reality and of myself. Visuals were comforting and pretty. I never felt any discomfort or anxiety. It was so wonderful tuning into God’s frequency and hearing His broadcast; inexplicably comforting. I shed tears that I needed to shed, appreciated the beauty in my life and gained valuable insight into the nature of existence. I feel renewed, refreshed and spiritually healed. Thank you so much for making this possible. This was my first time ever treating my PTSD and insomnia using magic truffles, I was really nervous at first about both the ordering experience and the truffles themselves, but I have to say that thanks to trufflemagic, I ordered my truffles and they came quickly and securely to my home in USA in exactly ten business days and I had a great first experience! The truffles actually tasted great, nutty and very fresh. I ate a little over half of the pack of utopia, and had an amazing night! I had a very strong emotional response to the first dose and was able to release a lot of suppressed emotions and see my life/relationships from an amazing perspective. 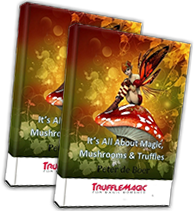 I had such a great experience thanks to trufflemagic so I jumped immediately on the Christmas sale, and ordered 3 more packs of truffles. This time I’m going to try it on an empty stomach for a stronger trip. 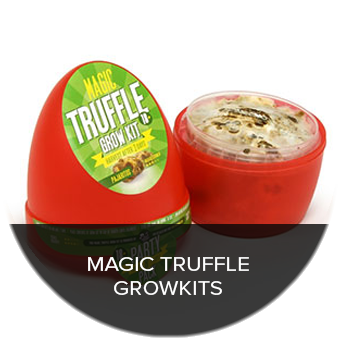 I will absolutely be recommending trufflemagic to many friends and family for their OUTSTANDING products, delivery, and customer support. THANK YOU TRUFFLEMAGIC AND MERRY CHRISTMAS!!!! I suffer from PTSD and was very keen to find out about Truffles. I had previously tried liberty caps many years ago so I knew what to expect and to be honest because of my experiences I was a bit nervous. The discrete package arrived without any dramas. The taste was nutty and not all all unpleasant which surprised me. The truffles acted on me pretty quickly. It was a very pleasant experience. I became very aware of light and while the visuals were not overpowering they were still there with room shape distortion and facial features quite pronounced in terms of being very 3D. The only thing I was slightly disappointed with was the length of time it lasted which was about 3-4 hours. Nevertheless I created a good ambiance with music and visual stimulation which with the truffles created a delightfully warm atmosphere. You do become a bit chatty towards the end as you want to share the experience. I would recommend this and for certain everything is legitimate in terms of business transaction. If you have any doubt at all do it but ensure you create a safe environment. I will be reordering in the immediate future. Took the whole 15g of truffles in one sitting….six hours later….wow! This parable sums up the trip better than I (?) can. he fell asleep, and dreamt that he was a beggar. I am a King, which is the dream? Ok so these took just over a week to arrive not bad going since they coming from overseas. wey. where to begin. Im on gram 8 within 2 hours… in fact im chewing them now while typing this…. Nothings happened. Id say 1 star so far like. waste of money. I’m sorry to hear that your experience hasn’t been what you expected it to be. The intensity of a trip relies on many factors, such as; sleep, food (amount & what), set, setting, personal health. Or perhaps the dosage was simply too low for you, this also varies per person. In any case, I hope this has cleared some up for you and hope to see you again in our shop :). 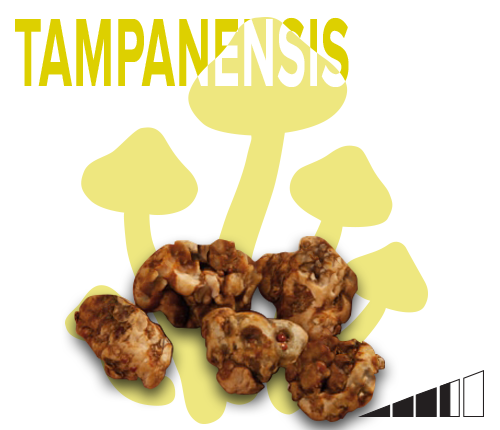 These mushrooms blew my head off, I went to Dam for a stag weekend and thought I’d try shrooms out, completely under estimated the Psilocybe Utopia, picked them because they was the strongest and just ate the whole bag thinking it wouldn’t be that bad. I was wrong. Next thing I knew I was convinced I was going to die and that the mini bus back the ferry was the last trip away from Earth during the apocalypse, visuals were insane beyond anything I’ve ever seen, screaming faces and fire outside the Windows, going through customs the sniffer dogs looked like hell hounds, wildest experience of my entire life really want to try these again in a comfortable safe environment and not walking round the red light district and not take such a large dosage! I ate a whole bag of the Psilocybe Utopia on my own. I wanted to do them with my wife but she is a little scared so when I had a day off I prepared by fasting for the evening and following morning @ 12 noon I started eating while tidying the house with drumming on YouTube. I made the lounge very soft, colourful, comfy and moved all my plants in the room to create a mini jungle to give me a conection to nature as I didn’t want to go outside. I got some icaros ready on YouTube a shaker and put comfortable cloths on and sat down. When I sat down I noticed a change in my body and a slight perception shift. I then closed all curtains and put a blind fold on so as not to be seduced by the visuals. After a short time I was in another world, full on trip. I was aware of spiders they being my teacher for this experience using webs as creations of of consciousness. At one point I noticed a slightly sinister turn so I changed the drumming for the shamanic icaros. These really helped and we successfully navigated a mind blowing happy experience I will be happy to take 20g next time but I have had many of these type of experiences b4. Don’t Take a whole bag on your own if inexperienced or yr in for a shock. 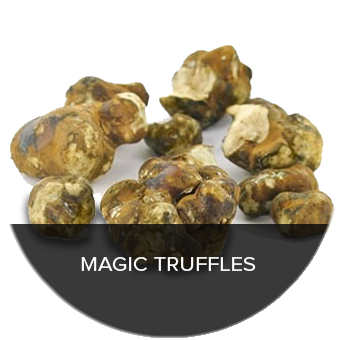 Great work from Truffle Magic no problems with order or delivery and good dre duly advice b4 and after purchase. Definitely recommend and will purchase from them in future. This one is worth the extra cost. It gives a real sense of well-being and pleasant trip, also tastes best of the ones I tried. Besides this one the Atlantis was also a very nice trip. I ate 20g of the Psilocybe Utopia and i was very impressed of the trip intensity..it was strong and the Open Eyed Visuals were almost as intense as the Closed Eye Visuals…another thing that i liked was that the trip lasted 5-6 and the 4hours were full of visuals and colors and very strong feelings..i recommend it but only for open minded or experienced users because it messes up with your head too..i thought i was god and could create life out of nowhere…also i thought that the sofa was a vast world and that each room was a different universe..